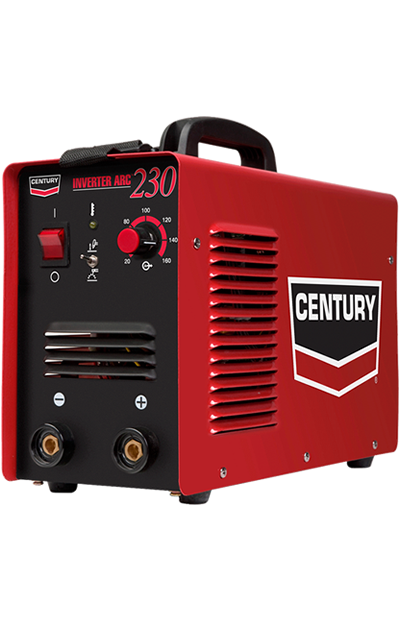 The Century Inverter Arc 230 Stick Welder is compact for portability and has a 10 to 155 amp output that supports mild steel stick electrode diameters from 5/64" to 5/32". The smooth arc provides strong welds on 18 gauge sheet metal to 5/16" thick steel. It has a 30% duty cycle at 150 amps that allows it to run 3 minutes out of each 10-minute period without overheating. A continuous amperage control permits exact temperature setting for consistent welds. Dimensions of unit 12 x 7 x 15 inches. Comes with a shoulder strap, work cables, electrode holder, work clamp, and input cable with attached three-prong plug.